Most people worry more about their risk of developing cancer than they do cardiovascular disease. But heart disease is still the number one cause of death in Western countries. Here’s the good news. According to the Centers for Disease Control and Prevention, 80% of deaths due to coronary artery disease can be prevented with lifestyle modification. These modifications include avoiding obesity, regular physical activity, and abstaining from smoking and heavy use of alcohol. Let’s not forget about diet! Dietary changes play a major role in cardiovascular risk and adding more vegetables to your plate is one way to lower your risk. How do we know vegetables reduce the risk of cardiovascular disease? The CARDIA trial is a study of over 2,500 adults in the U.S. that began in 1985. This study followed participants for 20 years. In the study, researchers volunteered information about their eating habits and how many servings of fruits and vegetables they consumed each day. At the end of the study, the researchers used imaging studies to measure and calculate a coronary artery calcium score. A higher calcium score is linked with a greater risk of cardiovascular disease and heart attack. They found that participants who ate the most fruits and vegetables were 26% less likely to have a high calcium score relative to those with the lowest intake. But WHY is a vegetable-rich diet linked with lower odds of developing cardiovascular disease? Here are 6 reasons backed by science. Hypertension is a major risk factor for cardiovascular disease. The good news is eating vegetables helps lower blood pressure. One of the best options is green, leafy vegetables. Why leafy greens? They’re rich in potassium and contain substantial quantities of magnesium, two minerals strongly linked with blood pressure control and healthy blood vessel function. Some vegetables, including leafy greens, are also high in nitrates. Once in your body, nitrates are converted into nitric oxide, a gas that helps dilate arteries and improve blood pressure function. Beets are another vegetable high in natural nitrates. In fact, a double-blind study showed that a daily cup of beetroot juice helped with blood pressure control, even in subjects who weren’t well controlled with medications. Vegetables have potential anti-inflammatory benefits. That’s important since inflammation is a driving force behind cardiovascular disease. Inflammation damages the inner walls of arteries and increases the likelihood of a blood clot forming. If a clot ruptures in a coronary artery, a blood vessel that carries blood to the heart, it can damage the heart muscle and trigger a heart attack. Most non-starchy vegetables contain antioxidant and anti-inflammatory compounds that help reduce inflammation. One that you might not think of is avocado. A study found that participants who ate a greasy hamburger had lower levels of two key inflammatory markers, IL-6 and NF-kB when they added a slice of avocado to their burger. Recent research shows that nitrate-rich vegetables, including leafy greens, reduce production of a hormone called erythropoietin. Erythropoietin increases the number of red blood cells circulating in the body. That’s important if you go to a high altitude where the air is thinner, and you need more red blood cells to carry more oxygen. However, too many red blood cells can thicken the blood to a point that it increases the risk of blood clots forming and reducing blood flow to various areas of the body. In fact, people who take synthetic erythropoietin have a higher risk of heart and attack and stroke. Eating more nitrate-rich vegetables may have an anti-erythropoietin effect that’s protective against heart attack and stroke. However, research in this area is still in its early stages. Ideally, you’d like your arteries to be as clean and free of calcium and plaque accumulation as possible. Plaque and calcium-free arteries help you avoid a heart attack. In a 5-year study of older women, participants answered questions about their diet, including veggie consumption. After three years, the subjects underwent an imaging study to look for plaque accumulation within their coronary arteries. The results? Those who consumed three or more servings of vegetables each day had 5% less accumulation of plaque relative to those who ate less than two servings daily. Vegetables are naturally low in calories and adding more of them to your plate helps with weight control. That’s important since obesity is a risk factor for cardiovascular disease. In fact, a study published in JAMA Cardiology in 2018 found that middle-aged, overweight and obese adults had a greater risk of developing cardiovascular disease relative to leaner people of the same age. The risk was elevated by as much as 85%. Type 2 diabetes and metabolic syndrome, where blood sugar is higher than normal increases the risk of cardiovascular disease. Non-starchy vegetables don’t cause blood sugar spikes. That’s because they’re naturally blood sugar friendly because they’re high in fiber. Fiber isn’t broken down by the body, although it may be fermented in the intestines by gut bacteria. Because it isn’t broken down, it doesn’t cause an elevation in blood sugar. If you add avocado to a plate of vegetables or a salad, you also get healthy fats that slow digestion, suppress appetite, and reduce the rise in blood sugar after a meal. The average person gets about half the amount of fiber they need for good health. Vegetables are a good way to boost your fiber intake! Now you know why you should add more non-starchy vegetables to your plate. 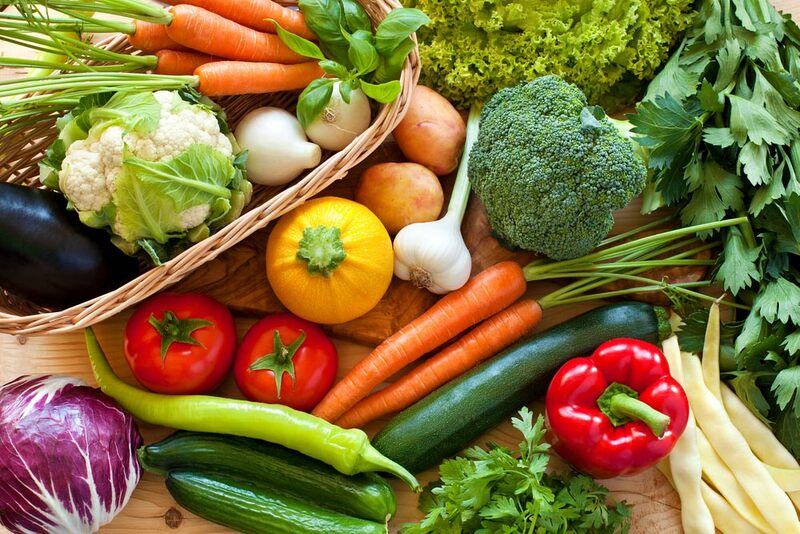 Choose vegetables in a variety of colors and you’ll get a diversity of vitamins, minerals, and phytonutrients. Raw or cooked – there are benefits. So, enjoy them raw AND cooked – just eat more of them. Free Radic Biol Med. 2014 Dec;77:353-62. doi: 10.1016/j.freeradbiomed.2014.09.021. Epub 2014 Sep 28. Hypertension. 2015 Feb; 65(2): 320–327. Food Funct. 2013 Feb 26;4(3):384-91. doi: 10.1039/c2fo30226h. Nutrients. 2018 Jan 27;10(2). pii: E136. doi: 10.3390/nu10020136. JAMA Cardiol. 2018 Apr 1;3(4):280-287. doi: 10.1001/jamacardio.2018.0022. If You Upgrade Your Lifestyle Later in Life, Do You Still Get Health Benefits? Plant Sterols: Do These Natural Compounds in Plants Have Health Benefits? Canned, Fresh, and Frozen Vegetables: Are They Equally Nutritious? Are Raw Vegetables Better for You? Does Peeling Fruits and Vegetables Eliminate Most of the Pesticides? Can a Natural Compound in Vegetables Slow Aging?